The media are making it increasingly difficult to conduct a rational debate on the criminal justice system, a probation chief has said. Chief Inspector of Probation in England and Wales Andrew Bridges said there was a need to focus on "mundane truths" rather than "exciting fallacies". Plans to tackle youth crime in England and Wales are being set out amid a spate of stories on knife attacks. But Mr Bridges said there were no "simple solutions" to target offending. Mr Bridges, who inspects probation and youth offending teams, warned overall re-offending rates remained "obstinately persistent" and expressed scepticism about what he described as "spectacular innovations". In his annual report, Mr Bridges said discussion about crime and offending was a highly emotional issue. He said there was an assumption that a "soft" or a "hard" approach needed to be taken with offenders. There are no panaceas for stopping people from offending but if practitioners do the right thing with the right individual in the right way at the right time, a real though modest reduction in offending can result. But it was difficult to identify genuine findings of what was effective. Mr Bridges said small projects had successfully reduced re-offending rates but research in the US cautioned against drawing conclusions from such schemes. Statistics show overall reoffending is persistent throughout Europe and North America. 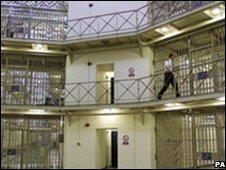 And while reconviction among adult offenders in England and Wales is down, a large amount of reoffending still takes place. Mr Bridges said offending could not be eliminated and he recognised that the public was entitled to expect the authorities to do their job properly. But he stressed that "It should not automatically be assumed that a further offence can necessarily be traced back to poor practice by probation, or youth offending staff and/or their partners." Mr Bridges said that, although putting offenders in prisons protected the public to some extent, it was an extremely expensive option with only a marginally small benefit in relative terms. "Whether offenders are locked up or not there are no panaceas for stopping people from offending. "The mundane truth is that practitioners need to do the right thing with the right individual in the right way at the right time, they can perhaps get up to one in 10 people to stop offending who might not have stopped otherwise."